Continuing what must be a subconscious focus on tough ’70s cop movies from Wednesday’s Brannigan post, this scene features Harry swilling Schlitz in front of the TV with Carol McCoy (Christine White), the wife of a suicidal traffic officer. When his superiors get word of a potential grocery store holdup, Harry – who had been demoted to stakeout duty – is called into action with his trusty .44. Interestingly, Magnum Force was Christine White’s second time playing a wife whose husband suffers from nervous breakdowns; ten years earlier, she played the wife of William Shatner’s character in “Nightmare at 20,000 Feet”, a famous episode of The Twilight Zone. Brown is a relatively uncommon color for blazers, assuming you follow the definition of a blazer as a structured odd jacket with metal buttons. 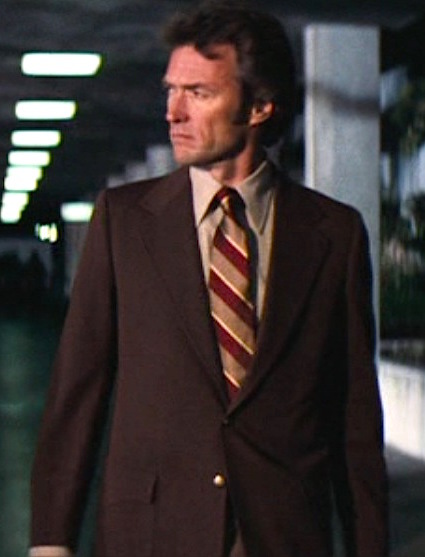 In Magnum Force, Harry wears both this brown serge blazer and a more traditional navy blazer. 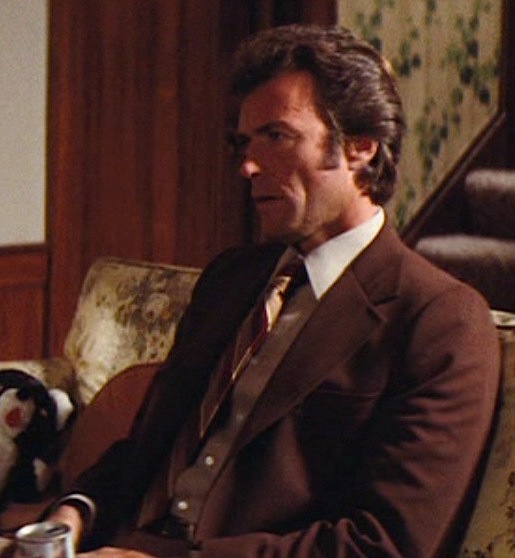 Clint Eastwood would later wear a different dark brown blazer in the following Dirty Harry film, The Enforcer. Harry’s brown serge wool single-breasted blazer has two gold crested shank buttons on the front as well as two smaller gold buttons spaced on each cuff. The blazer has some concessions to the decade with its fashionably wide notch lapels and long single back vent. Harry strolls into the station with his partner Early Smith (Felton Perry). Will Early meet the same fate as Harry’s other partners on the force? In addition to a welted breast pocket, Harry’s brown blazer has sporty inverted box pleat patch pockets with flaps. Harry’s light taupe shirt has a large collar, plain front, rounded breast pockets, and breast pocket with a straight yoke. His maroon and gold repp tie follows the traditional American “downhill” stripe direction with a thin beige stripe bordering under each of the gold stripes. Harry approaches his latest kill. When Harry removes his blazer in the grocery store, he reveals his light brown leather shoulder holster, reportedly custom made by Jerry Ardolino for the films for Eastwood to carry his iconic large-framed Smith & Wesson Model 29 revolver under his left arm. You can read more about the original holster at Lawman Leather Goods. The holster fastens to the right and left sides of Harry’s belt, a strap of wide brown leather with a large brass single-prong buckle. Harry wears taupe brown gabardine flat front trousers with slanted side pockets, two jetted back pockets (with a button through the left back pocket), and plain-hemmed bottoms. Harry appears to be wearing the same shirt, slacks, belt, shoes, and socks that he would wear with his brown herringbone tweed jacket during the finale. He wears dark brown leather plain-toe derby shoes with dark brown cotton lisle socks that match his footwear rather than his trousers. Harry darts through the aisles of hte grocery store in search of his target. Those shelves of white porcelain vases and flatware surprisingly made it through this action scene mostly intact! Clint Eastwood does not wear a watch in Magnum Force. Harry kicks back with a can of Schlitz, the classic Milwaukee-brewed beer that had dominated American beer production through the beginning of the 20th century before settling into its comfortable connotation as a working class brew of choice, very fitting with Harry’s image. Schlitz and stuffed animals. Hell of a Friday night, Harry. Though it isn’t featured in this scene, Olympia beer was also a Clint Eastwood favorite that he promoted in this film as well as many of his major roles through the decade. Harry Callahan’s shades of brown reflect the earthy, no-nonsense character as well as the palette of the era. Harry Callahan’s blue steel Smith & Wesson Model 29 attained iconic status the instant Clint Eastwood drew it from his shoulder holster in Dirty Harry. Two years later, Harry carried the same weapon with a 6.5″ barrel and rosewood grips in Magnum Force. Harry steadies his aim as he eyes the Cost Plus robbers through the store’s two-way mirror. Harry’s line that his .44 load is “a light Special” has led some to interpret that his Model 29 is actually loaded with .44 Special ammunition rather than the more notorious .44 Magnum. Check out Magnum Force or pick up the entire five-film Dirty Harry collection . Well, here’s three salty-lookin’ dudes! Always wondered how small the Model 29 would look in the hands of John Wayne. A man’s got to know his limitations.